Clean for The Queen is a campaign to clear up Britain in time for Her Majesty the Queen’s 90th birthday, which will be officially celebrated in June 2016. 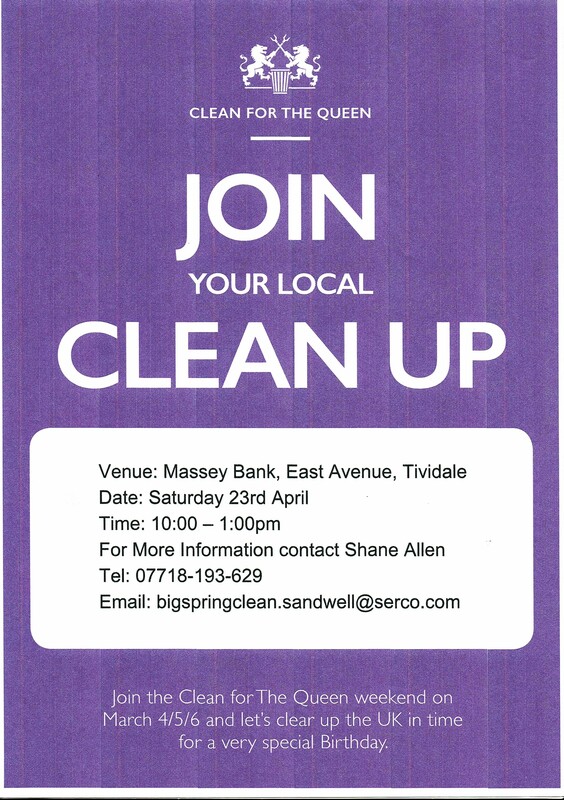 We are holding a litter pick in partnership with Serco and Keep Britain Tidy as part of Clean for the Queen; why not join us on Saturday 23rd April, 10:00am – 1:00pm to get Massey’s Bank looking spick and span! Click here for more information about the Clean for the Queen campaign; you can also contact Shane Allen for more information about this particular event on 07718 193629 or bigspringclean.sandwell@serco.com. This entry was posted in Events and tagged Black Country, Clean for the Queen, Friends of Rowley Hills, Litter pick, Masseys Bank, Rowley Hills, West Midlands on March 4, 2016 by janetav.